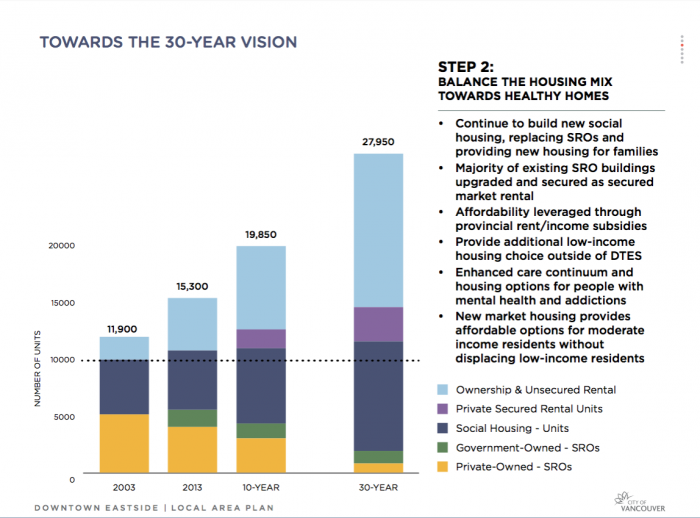 30 Years of Vision? Yikes! Do Not Register to Speak. Yet. It was made painfully clear through mantra-like repetition that a "no attribution" rule intended that presenters and question-responders not be identifiably or directly quoted. What a pity. They had quite a few frightful things to say. No confidences will be broken by extracting a few items from the Executionary … er … Executive Summary that provided the framework for this afternoon’s presentation. One item blinks through the fog. It could be the biggie that beacons shipwreck for a low-income neighbourhood that has a long history of offering refuge from the burgeoning costs of a wannabe world-class city. Never heard of octuple? That means multiply by eight. How does this math add up? First, the City of Vancouver aims to freeze the low-income Downtown Eastside population component at around current levels. 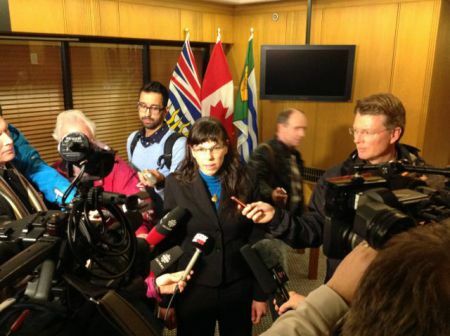 Second, the policy going forward amounts to saying: "No new low-income residents wanted in DTES. It's time to export them to … somewhere else." 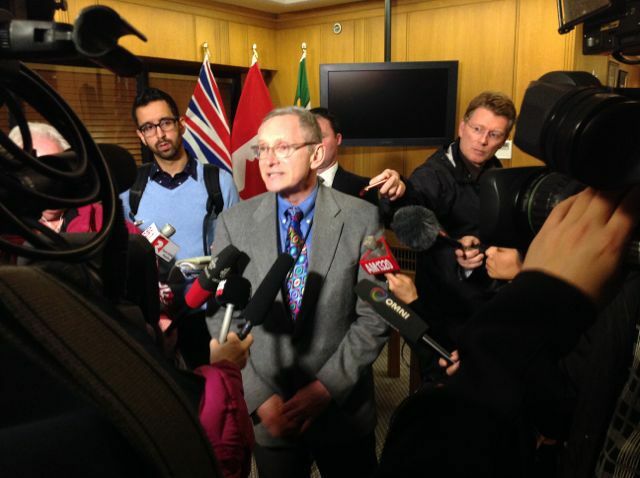 The City of Vancouver wants everything to grow grow grow. Well, maybe not the low-income-resident population. Just everything else. If the corporatocracy can pull this one off, they’ll use the growth in higher-income residents to dilute, and then to swamp, and eventually to disappear the low-income ingredient from their notorious social mix recipe. Whatever line they spout, the deal-makers are aiming to toss that constituent right out of their gentrification mixing bowl as fast as they can. 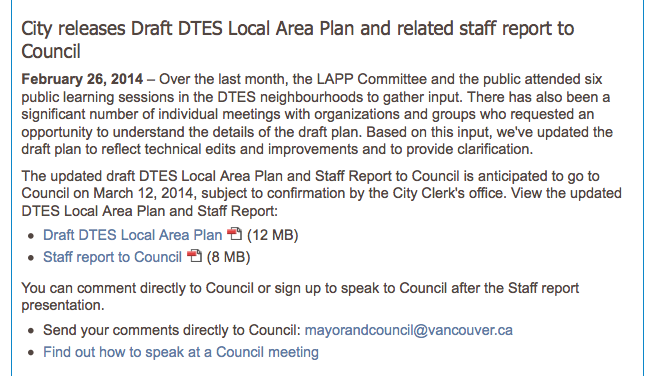 The updated draft DTES Local Area Plan and Staff Report to Council is anticipated to go to Council on March 12, 2014, subject to confirmation by the City Clerk's office. … You can comment directly to Council or sign up to speak to Council after the Staff report presentation. One way of manipulating a situation is to overwhelm. 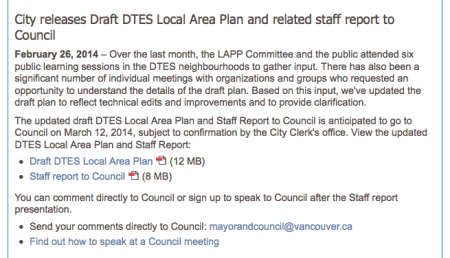 The DTES plan's 320 page report to Council was released only two weeks ahead of time. Another cute move — yank down as hard as possible on the window for registering to speak to Council. Top it all off with timing the session for just ahead of spring break to cut down on the turnout as much as possible. Lots of nasty tricks are tumbling out of the City Hall playbook in this particular endgame. 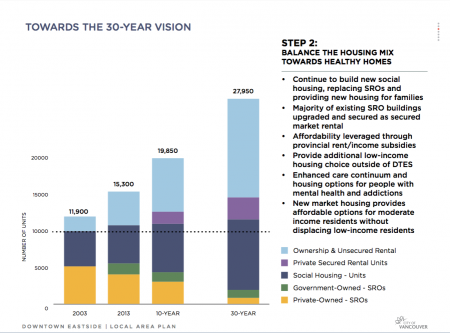 Oh, almost overlooked — a “Public Benefits Strategy” snuck in right at the end of the Executive Summary. The bottom line total for that is $1.05 billion. No, politicians and bureaucrats are not planning to liquidate their fabled Property Endowment Fund that they wish you didn’t even know about. No no. Somehow half of that humongous wad is supposed to materialize from unspecified “partners.” If you don’t think that hope is faint, dig this one: another 30% is supposed to come from developers. Can’t you already see those sharks lining up to fork over their one-third?